There are a few new heart throbs on the set of Downton Abbey for Season Four but none so handsome or charming as the twins who were cast in the role of George Crawley, Lady Mary and Matthew’s son and heir to the Downton Abbey fortune. Identical twins Logan and Cole Weston started their acting careers at the age of six months old with this role on Downton Abbey and are never seen on screen at the same time. 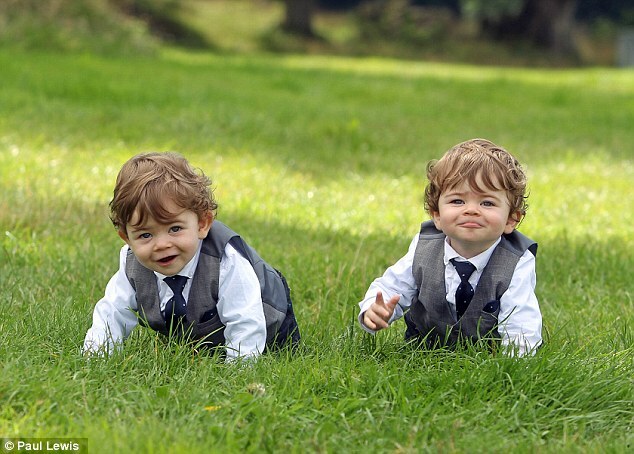 The twins are from the village of Meathop in Cumbria and are quite the stars. The producers provided them with their own trailer with a TV, cots, a sofa, and some toys. “Baby George” was even on the door. A breakfast bottle was given promptly at 7 a.m. with a nap for an hour between 10am and 11am and then lunch at noon. There was another nap and tea time at 4 p.m. and in bed by 7 p.m. Essentially filming for them took place between 11 a.m. and 12 p.m or between 3 p.m. and 4 p.m. when they weren’t napping or eating. Each scene was no more than 20 to 30 minutes with a 15 minute break between takes. Luckily for Logan and Cole, no make up was necessary. They did have a full wardrobe of Baby George romper suits though. If one of the twins was having a “bad” day then the other would be used in the scene. Poor Logan was teething during filming and wasn’t feeling his best so he ended up doing most of the photo shoots and Cole did most of the acting. Charlotte and David Weston, Cole and Logan’s parents self-admittedly have no acting talent but signed up their sons with an agency on a whim at the age of two months old. “Somebody had said to me that they are always looking for twins in TV and they are very cute with their big blue eyes and mass of hair, so we thought we would give it a go,” Charlotte said. “But we were a bit shocked and panicked when we realized they had landed the role of baby George. They are sooooo cute!!! And I can’t wait to see those cute little cheeks on my TV!!!! Look out Tom Cullen! There are new cuties at the Abbey!!! !